We’ve got great news for internet users around the world today: We did it. We made the internet better. 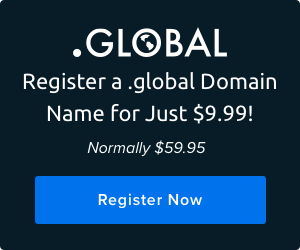 This month DreamHost chose to take a stand on something that will ultimately benefit all internet users who value their right to privacy and the ability to view websites of their choosing anonymously. We didn’t have to . . . but we kind of did have to. This week the U.S. Department of Justice backed down — just a little — on what we considered to be an unreasonable records request in an ongoing criminal investigation of a site hosted at DreamHost, DisruptJ20.org. Our argument was straightforward — information that could be used to identify tens of thousands of internet users who simply visited the website would have been handed over to the U.S. government in a sweeping request for data. In our opinion, this was a clear case of investigatory overreach. Our private protestations to the DOJ fell on deaf ears and were met not with dialogue, but with a prolonged silence followed by a “motion to compel” DreamHost to deliver all data originally requested. After we went public with our concerns, the wave of public outcry from concerned citizens, judicial pundits, and commentators of all political backgrounds seemed to sink in. By Monday evening, the Department of Justice had relented and filed an amendment to remove some, but not all, parts of the data demanded in their warrant that we considered to be troubling. We noted that the government took the relatively conspicuous step of filing its paperwork late Tuesday afternoon in what we can only speculate was an attempt to avoid further coverage by news media. This late-in-the-game re-scoping of the request for data by the DOJ was a step in the right direction, but it didn’t go far enough. In fact, we filed a sur-reply with the court in response yesterday afternoon. Today in a Washington D.C. courtroom, we had a chance to present our arguments against what we still considered to be an overly-broad records request. We took issue with the sheer scope of this single request for information. Collecting the browsing habits of many tens of thousands of general internet users (who were exercising their own right to free speech and free assembly) in the pursuit of a criminal investigation against a single website owner raised strong First and Fourth Amendment questions for us. Despite the narrowing of the DOJ’s request for data, individual website visitors could still potentially be identified via emails and discussion lists. The core issue remained: many users could find themselves, and their actions online, caught up in an investigation in which they were not the targets. Rather than refuse the request outright, we chose to pursue the issue through the legal channels available to us and attended today’s hearing to seek clarification. This morning Chief Judge Morin of the Superior Court of Washington D.C. took the time to examine the DOJ’s initial warrant and their amendment, weighing them against our concerns. We’re pleased that the court further limited the government’s access to this data today. Chief Judge Morin confirmed the validity of the Department of Justice’s amended request, with some changes, and he is enforcing the DOJ’s motion to compel. As a company that operates lawfully in the United States, we are now obligated to comply with the court’s request. 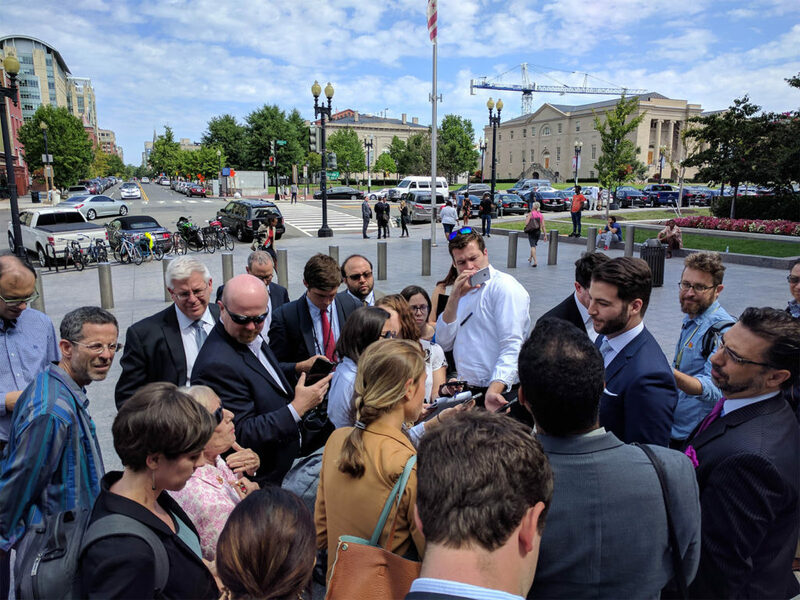 DreamHost’s legal team speaks with members of the press after today’s hearing. Given the extraordinary privacy and First Amendment issues raised by this case, the court has chosen to effectively shackle the Department of Justice in several key ways, all of which act to limit exposure of sensitive and private user information. The court has asked the DOJ to present it with a “minimization plan.” This plan is to include the names of all government investigators who will have access to this data and a list of all methods that will be used to comb through it in search of evidence. The production of evidence from this trove of data will be overseen by the court. The DOJ is not permitted to perform this search in a bubble. It is, in fact, now required to make its case with the court to justify why they believe information acquired is or is not responsive to (aka: “covered by”) the warrant. The court will then seal any information that is acquired but then deemed to be “not responsive.” After that point, this information will not be available to the government without a court order. Further, the Department of Justice is forbidden from disclosing the content of this responsive information to any other government agency. This is an uncommon step for the court to take, but it speaks to the sensitive content of this site and the First Amendment issues raised. Sometimes big wins don’t look like big wins. Sometimes they look like a lot of little wins, all strung together! That’s what’s happened here. The de-scoping of the original warrant, combined with the court’s additional restrictions on the use of, and access to, that data, is a clear victory for user privacy. If we had simply remained silent and handed over the data at the first sign of a warrant, investigators would today be sitting on a pile of information that could be used to track down and identify tens of thousands of individual web users who are themselves accused of no crime but would have found their personal browsing habits included and associated with this investigation. As a result of our challenge, the DOJ ended up severely restricting the scope of data which was included in their original records request, effectively preventing them from fishing for evidence in a sea of unfiltered data extracted from our servers. This is an enormous privacy win for all internet users and for any service providers that host user-generated content online. We look forward to working with the Department of Justice and the Court as we hand over data that is an extremely limited subset of the original request. While we’ve been compelled by the court to share this (still) large cache of data (and will do so in the next few days), the DOJ will not gain access to it immediately. We are considering an appeal which would deny the government the ability to access that data temporarily and potentially forever if our appeal is found to have merit. It has been an emotional couple of weeks here at DreamHost HQ. We have been humbled by the very public outpouring of support over this case, and the countless heartfelt emails and messages we’ve received on social media have shown us just how important this issue is to so many internet users. We’re a small company. We don’t have endless resources, and we have to pick our battles. The circumstances of this case were so extraordinary that we felt like we had no other choice but to step up and say something. So we did. Thank you for helping make that an easy decision. Members of the media seeking comment, please send requests for comment or interview requests to privacy@dreamhost.com. Appeal! This is STILL over reach by the DOJ and a violation of the privacy of your users! Protect your Users! On your side. Thanks for taking a stand! Is there nothing else you can do? ACLU? Appeal? Do you have an attorney(s)? I understand the victories… ‘Ya did good!” Trump and DOJ should get no info! This is Dangerous and Not Normal. They’re bullies and can’t be trusted. Limit it more. Require them to have specific suspects first (with identifiers). Then and only then can they get limited info on only those specific suspects. Hope I’m making sense. Pulled an all-nighter working. I’m not bashing you. I’m against them. Hang in there! In solidarity. Lori Smith, activist, Nashville, TN. Appeal! I for one promise to donate $100 if you do. I understand the marketing motivations for spinning it thus, but come on. This is NOT a huge win for privacy. It’s more like, the wolf got into the henhouse and a few hens survived, and you’re calling it a great day for hens because a few lived to see another day. Minimization, supervision!? Feh! The Fourth Amendment says what it says in plain language, and this ruling does NOT abide by it. btw, I’ve been a DH customer since 2006, and I <3 Dreamhost. Thank you guys for standing up for what is right. I’ve been a DreamHost customer since 2008 and never have I been more proud to be. Keep up the good fight, for the world is watching.